[prMac.com] Cupertino, California - Current users who have fallen in love with WildPalm Ltd.'s Quick-Tap, as well as new users who have yet to experience this popular no-cost utility app, will soon be able to head to the App Store and download the new-and-improved version 1.1, which is a major update featuring drag-and-drop item re-ordering and customized icon layouts. Also as noted above, version 1.1 offers even more versatility, as users can take advantage of drag-and-drop item re-ordering and customized icon layouts. "The response we received from users around the world after launching Quick-Tap last September was incredibly positive, and exceeded our highest expectations," commented Nigel Grange of WildPalm Ltd. "Clearly, there is a huge demand for what Quick-Tap delivers, which is essentially a way for users to regain control over their device so they spend more time enjoying their apps, connecting with their contacts, listening to their favorite music and more - and virtually no time getting lost in a maze of confusion. And now with version 1.1, we've made Quick-Tap even more versatile, which we hope will delight our existing users and impress our new ones!" 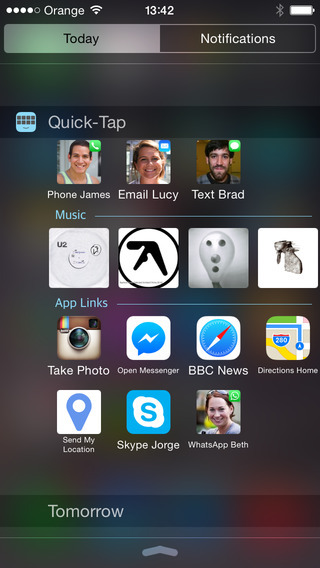 Quick-Tap 1.0 is Free and currently available worldwide exclusively through the App Store in the Utilities category. Version 1.1 of WildPalm Ltd.'s popular no-cost iOS utility app Quick-Tap will be available soon from the App Store. WildPalm Ltd. is the home for quality software for iPhone, iPod touch & iPad. The company's suite of iOS apps include: Quick-Tap, Pumpkin Head, Video DS - Dualscreen Video Player, Hear This!, Badger Face, Facebook PhotoStream, Camera FX Lite, Football FacePaint Live - 2010 Edition, Camera FX, Sync Browser - Firefox Bookmark Sync, Easy PDF, Fractal HD, iSearch and Fractal Touch. All apps are available now in the App Store. All Material and Software (C) Copyright 2014 WildPalm Ltd. All Rights Reserved. Apple, the Apple logo, iPhone, iPod and iPad are registered trademarks of Apple Inc. in the U.S. and/or other countries. Other trademarks and registered trademarks may be the property of their respective owners.